This review proves that Public Millionaire is a scam that wants you to lose money. It is presented by Pat Brouse. 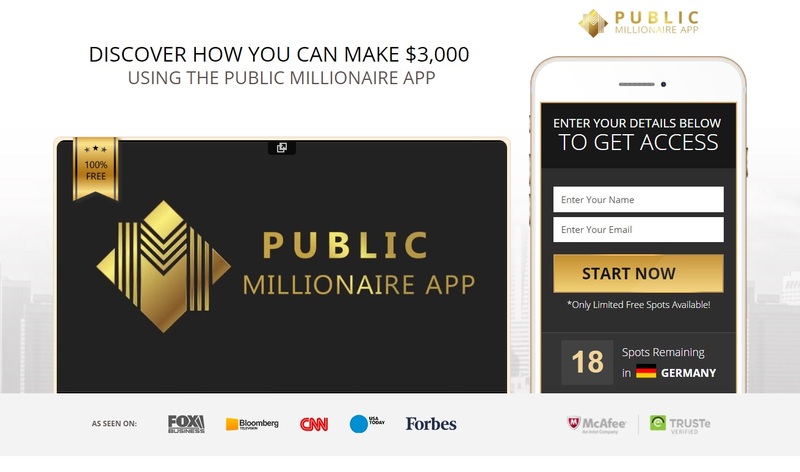 The Public Millionaire App was made to trade binary options and it allegedly can make you between $1,000 and $3,000 per day, because it copies trades made by successful hedge funds. And as we all are used to money being free (right? ), you can get Public Millionaire for free. The truth of course is that money is not free and that the Public Millionaire App is a scam. It won’t make you any money. In fact, it will take your money and lose it. The guy presenting Public Millionaire is a known scammer. We don’t know his real name, but we know that he is a scam artist. Look at the picture and you will see a proof. Last year he presented the 300 Millionaire scam and he called himself Michael Bennet. You see, he is presenting different scams under different names and each time he promises you millions. The Public Millionaire website is full of fake things. For example this trading program never appeared on Fox Business, Bloomberg, CNN, USA Today nor Forbes. You can do a search on those websites to see for yourself. Another fake thing is the testimonials. In the video they used paid actors, meanwhile some photos used on the websites are stolen. Look at the picture to see an example. The allegedly live feed with trading results is fake and this face belongs to Jessica Parido. She has no idea that her identity has been abused by Public Millionaire. The real purpose of the Public Millionaire App is to make you open an account and deposit money with a certain broker. This is because people who run this scam are getting paid by this broker for referring new depositors. That’s all. But if you do it, deposit money and let Public Millionaire trade your account, you will lose your deposit. The Public Millionaire App is a scam that is designed to make you deposit and lose money. Stay away from it! If you want to learn how to make money with binary options, open a free demo account and test until you have a profitable strategy. Only then you can start trading with real money. This is how binary options trading really works.